Director Wes Anderson was very easy to fall in love with. His debut film, Bottle Rocket (1996), starring his goofily charming friends the Wilson brothers, won him early cult status. Rushmore was built on a witty and distinctive voice, and Anderson's visual brilliance came into sharp focus with The Royal Tenenbaums, an elaborately wrapped present to a generation that wanted its own J.D. Salinger, one without the hermit-like lifestyle and creepy Joyce Maynard baggage. But Anderson proved easy to fall out of love with as well, as his subsequent movies became bogged down by a tendency to revisit the same themes  broken families in need of healing  and control issues that were outsize even for a filmmaker. With The Life Aquatic with Steve Zissou there was the sense of being sucked into a rabbit hole dug by Anderson, and by the cloying The Darjeeling Limited, his self-indulgence had swollen to the point where the hole was too claustrophobic for any but his most devoted fans to bear. One would think then, that a trip with him down an actual hole, albeit one dug by a family of foxes, might be pure torture. But Anderson's stop-motion Fantastic Mr. Fox is both a delightful amusement and a distillation of the filmmaker's essential playfulness. It's not quite tongue-in-cheek but very self-aware, in a good way. "Why yes," Anderson seems to be telling us. "I do like to play with dollhouses. And look what I can do with them. 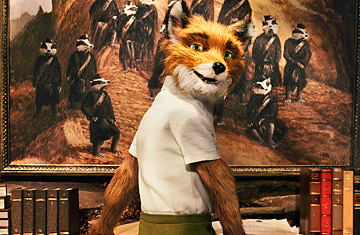 See the way Mr. Fox's fur stirs in the nonexistent breeze, isn't that marvelous?" It is, even if it's different from Roald Dahl's children's story about a fox clever enough to outwit three mean farmers named Boggis, Bunce and Bean, one fat, one short, one lean (no one can say that just once). Dahl's spirit is there, but the cinematic Fantastic Mr. Fox comes fortified with Andersonian pouting, parental issues, self doubt and philosophical conundrums. "Who am I, Kylie?" Mr. Fox (voiced by George Clooney) muses to the sidekick Anderson has created for him, an opossum voiced by Wally Wolodarksy  then clarifies: "I'm saying this as an existential question." The question arises because Mr. Fox, who it must be noted wears slightly too tight, too short suits made of corduroy or tweed, just like his director, is feeling stymied. In a prologue, set two years before our story begins (that's 12 fox years), Mrs. Fox (Meryl Streep), announces she's pregnant and forces him to give up fowl thievery for a safer profession. Now he's a newspaper columnist (which hardly qualifies as safer), but he longs to return to the hunt, specifically to Boggis, Bunce and Bean's farms, all of which are laid out in glorious, tempting symmetry just across from the front door of the Fox's "finest quality indigenous" old-growth tree house. Dahl's Mr. Fox is cocky and clever, although maybe not as clever as he makes himself out to be. Anderson's Mr. Fox is the same, but more so. He's like a mid-career tribute to Clooney: bold, charming but naughty, dependent on his smile, but well aware of that. And because of his urges  "I'm a wild animal," he reminds Mrs. Fox  he's not altogether trustworthy, which seems like a nod to a reputation that Clooney happily feeds every time he parades a fresh piece of arm candy about the red carpet. Seven-year-olds may be oblivious to the meta-Clooney, but their mothers will certainly get a kick out of him. That's not the only inside joke likely to go over the heads of small Fox fans. Badger (Bill Murray) is no longer just a neighbor, but a lawyer who gives advice on mortgages. Mrs. Fox, so sweetly supportive of her partner in the book  it is she who dubs him "fantastic"  is now a dubious sort who limits all praise and wields a sharp claw. Mother to four in Dahl's story, here she has only one kit, Ash (Jason Schwartzman), who is petulant, undersized, uncoordinated and insecure. "You're supposed to be my lab partner," he says to a comely young fox named Agnes, who is distracted in their biology class by the Foxes' glamorous houseguest, Ash's cousin Kristofferson (voiced by Anderson's brother Eric). "I am," Agnes protests. "No you're not," he scolds. "You're disloyal." It's a hilarious moment, but perhaps only if you're familiar with the crew of other insecure brats Schwartzman has played for Anderson. But there is also much humor in the purer, simpler Wallace and Gromit vein as well, enough to bewitch the youthful members of the audience. The foxes are entirely civilized until it comes to meals; then they gobble feverishly and without restraint. Kylie is a loyal sidekick but not the brightest opossum in all the land; when confused, his eyes transform into dazed little bull's eyes. A beagle with a case of "chronic rabies" is used to great effect, and Boggis (Robin Hurlstone), Bunce (Hugo Guinness) and Bean (Michael Gambon) are brilliantly realized. Stop-motion is clearly a laborious business, but what shows in Anderson's film is not the work, but the joy derived from a craft used to maximum effect. If Fox Searchlight wanted to double its box office, they need only set up a booth selling models of Anderson's Fox family right outside the door of the theaters; they're as appealing as any stuffed toy Steiff has ever made. As for Mr. Anderson, he, like Mr. Fox, has dug himself out a hole by going deeper into it. Fantastic.